South Australians are now getting viral hepatitis information in more ways than ever before. In 2015-16 Hepatitis SA received orders from individuals for over 14,100 items of printed information; its website had over 29,380 page views. In 2005, the organisation’s online presence was one small static website and information was disseminated mainly in printed form. Today Hepatitis SA has a two Twitter accounts, three Facebook pages, an online hepatitis C self-assessment tool, a WeChat account, and an AdelaideBBS account, all backed up by a dynamic website with regularly updated articles. This is an indication of the way health information provision has changed in the last decade. With the increasing accessibility and capability of smartphones and portable devices, there’s no doubt the number of people getting health information from the internet would have increased in the four years since that study was done. Hepatitis SA had responded to this changing health information environment by regularly updating its website content, sending out electronic alerts, developing an online catalogue for its library and increasing web presence through various social media platforms. Providing accessible, up-to-date information about hepatitis had been a core service for Hepatitis SA since its inception 21 years ago. To provide people affected by viral hepatitis with accurate, relevant information to help them make sound decisions about their health condition. To increase knowledge and awareness in the wider community about viral hepatitis and in so doing, reduce transmission risks and reduce stigma. Providing accessible, up-to-date information about hepatitis had been one of Hepatitis SA’s core services since its inception 21 years ago. From the early days of basic information our collection has grown to a wide range including recipe books, promotion items, posters, information about exercise, colouring sheets, children’s books, low-literacy resources, info-graphics, bookmarks, wallet cards, videos and information audios. Topics range from basic facts about hepatitis b and hepatitis C, to transmission, testing and treatment. and living well with viral hepatitis. Our quarterly Hepatitis SA Community News carries personal stories and updates on policy developments and research. 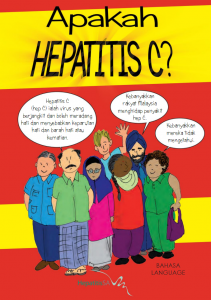 Hepatitis SA also has a limited but useful resources in other languages including Vietnamese, Chinese, Bahasa Malaysia, Pitjantjatjara, Nepali and Russian. To see the full range of our publications visit our issuu page. Today, Hepatitis SA still disseminates hepatitis B and C information in print, but information is also provided via a website, Facebook pages, Twitter, SoundCloud, our online library collection, online publishing, over the telephone and via electronic alerts. Some online platforms such as YouTube, Issuu, Flickr and SoundCloud act as a repository of easily accessible resources, while the website provides basic information, news updates and useful links. The Twitter and Facebook pages provide quick, on-going updates. Call the Hepatitis SA Helpline on 1800 437 222 any time between 9 am and 5 pm, Monday to Friday. The service is free and confidential. You may discuss all aspects of hepatitis B or C with the helpline worker. All calls are taken by workers trained to provide accurate information without judging the caller. Call 1800 437 222 to book an appointment. Face to face information is provided on site at 3 Hackney Road, Hackney 5069. All sessions are confidential and privacy is maintained at all times. Workers, or anyone else, who wants to keep up to date with regular notices can sign up for electronic alerts including general alerts and library updates. Click here to register. All Hepatitis SA services, including printed resources, are provided free of charge. For more information call 1800 437 222 or email admin@hepatitissa.asn.au. Next Next post: Eat Well to Feel Well – Convenience Food or Convenient Food?